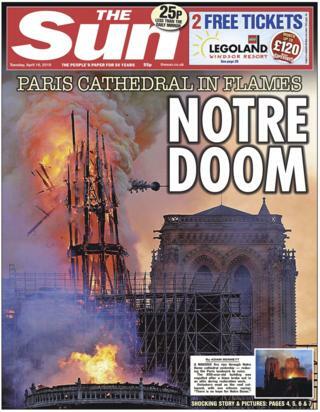 With the headline “Notre Doom”, the Sun shows the moment the spire collapsed. 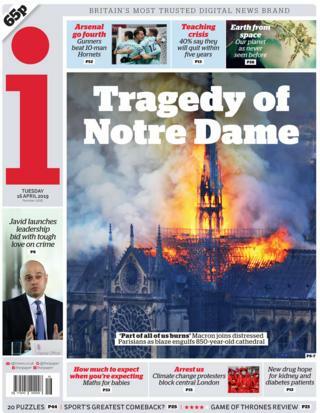 An American tourist quoted by the paper describes how the smoke was everywhere, with the flames “getting bigger and bigger” and “pieces of the scaffolding falling”. 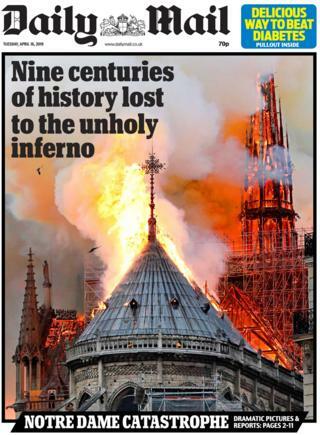 The paper reports the cathedral’s “three world-famous, stained-glass rose windows – intricate glasswork depicting religious figures, kings and prophets – had exploded in the fire”. 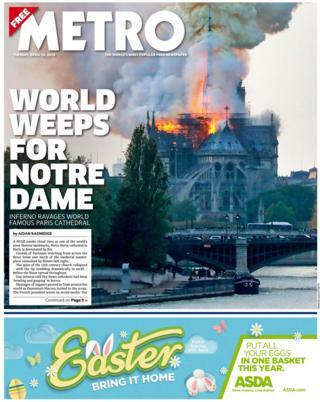 It said the Archbishop of Paris “called on all priests in the capital to ring bells throughout the city”. 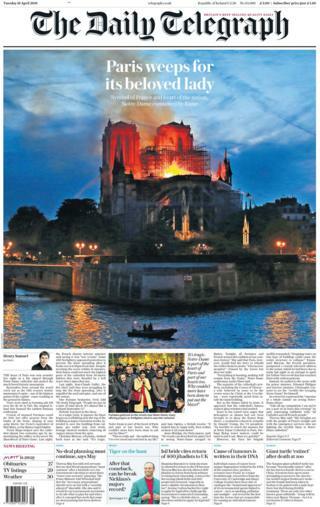 The president of the French bishops’ conference, Bishop Éric de Moulins-Beaufort, tells Catholic newspaper the Tablet he “screamed in horror” at the sight of the cathedral ablaze, describing it as “a part of our flesh that is damaged”. 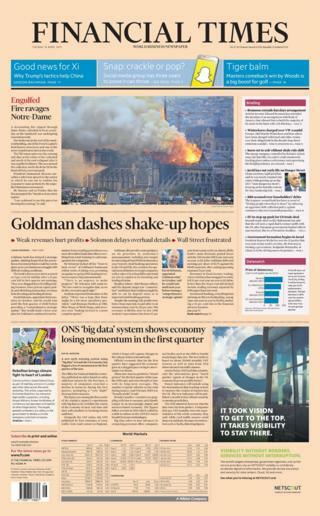 Several candidates for next month’s European Parliament elections suspended campaigning in the wake of the blaze, with one describing it as a time of “national mourning”, the French daily reports. 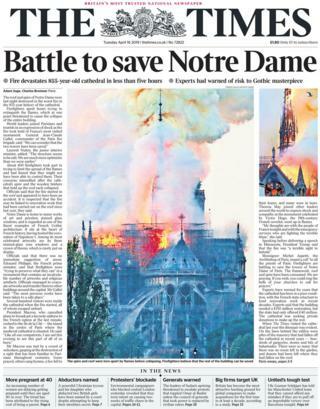 Josh White, for the Daily Mail, said the gothic cathedral “stood firm through holy wars, a revolution and Hitler… but couldn’t survive the builders”. 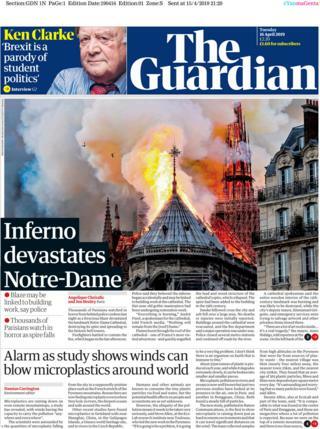 The director of the Notre Dame Foundation, Éric Fischer, believes it will “take decades to rebuild”, according to Le Monde. In the Daily Telegraph, architecture critic Jonathan Glancey calls for “a new Victor Hugo” to champion this “gothic survivor” and ensure it’s sympathetically restored. Huffpost UK reports the speaker of the US House of Representatives, Nancy Pelosi, has warned there will be “no chance whatsoever” of a trade deal between the UK and the US if Brexit causes “any harm” to the Good Friday Agreement. Ms Pelosi is said to have used a speech at thee London School of Economics on Monday night to warn that peace in Northern Ireland “must not be “bargained away”. It says “one in 10 NHS posts are unfilled” and “at some hospitals one in five nursing posts are empty”. 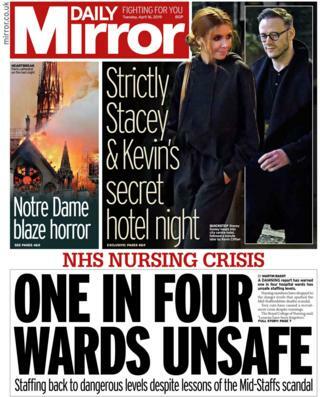 The Royal College of Nursing expresses concern lessons have not been learned from the “Mid Staffs scandal” – when hundreds of patients died due to poor care linked to inadequate staffing. 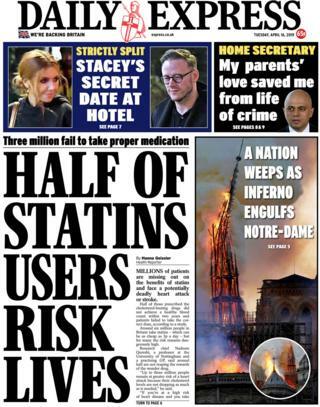 The Daily Mail, which also carries the story, includes a response from the Department of Health. It insists that thousands more nurses are on wards or in training and that its long-term plan “will ensure the NHS stays the safest healthcare system in the world”. The Guardian reports researchers have discovered that winds can carry harmful microplastics “anywhere and everywhere” around the world – meaning they are even polluting remote mountaintops. Their report found that “an average of 365 plastic particles, fibres and films were deposited per square metre every day” in a supposedly pristine stretch of the Pyrenees. The lead researcher expresses his fear that there is not “an organism on Earth that is immune”. Monkeys living at the attraction are said to amuse themselves by “ransacking bins and ripping bags apart in search of food”, discarding crisp packets that are then blown into a national park. The works – on the themes of sexuality and loneliness – were found on a sheet of paper hidden within a photograph frame. They are to be sold at auction, along with pictures of Du Maurier with the Queen and the Duke of Edinburgh , with whom the author and her husband were friends in the 1940s and 50s.